So began the sample script sent to 60 Minutes by the consultant hired to help make the upcoming centennial an event of national significance. CBS didn’t bite, and the proposed segment never come to fruition. Nor did the BBC documentary, the exhibition at the Cooper Hewitt, the commemorative book, or the set of branded home furnishings. Plenty of other proposed commemorations did take place, however, including the inevitable “top 100” lists and a scholarship competition for high school students. 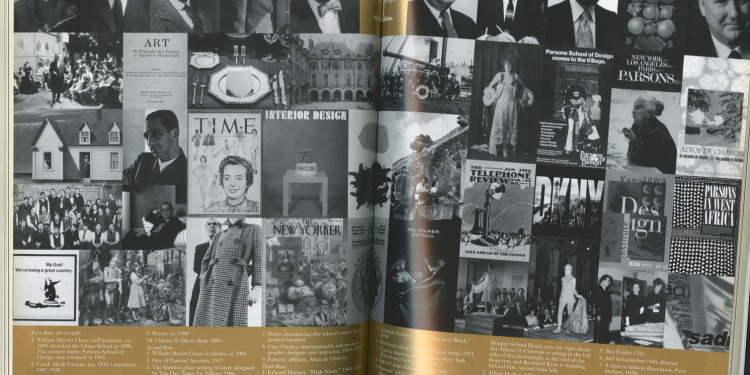 The annual Fashion Critics Awards Benefit, its program (above) printed in gold, fêted alumna Donna Karan and included a decade-by-decade show of historical fashions in red. Other historical work was lovingly miniaturized for customized dolls. There was also a nifty logo: Century 1. 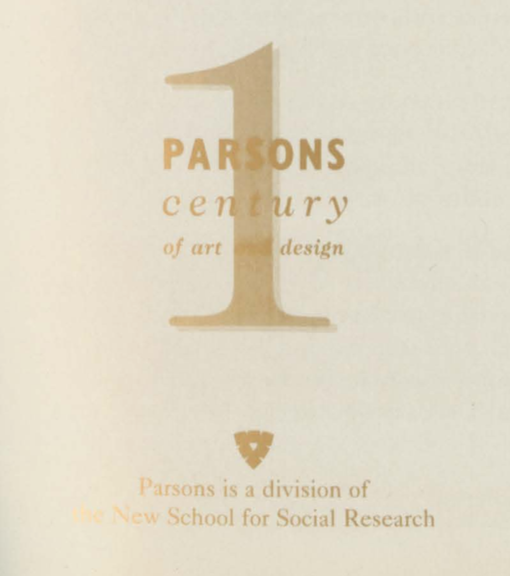 1996, the centennial year of Parsons School of Design, seems a long time ago now, as the younger New School onto which Parsons was grafted in 1970 approaches its own century mark. 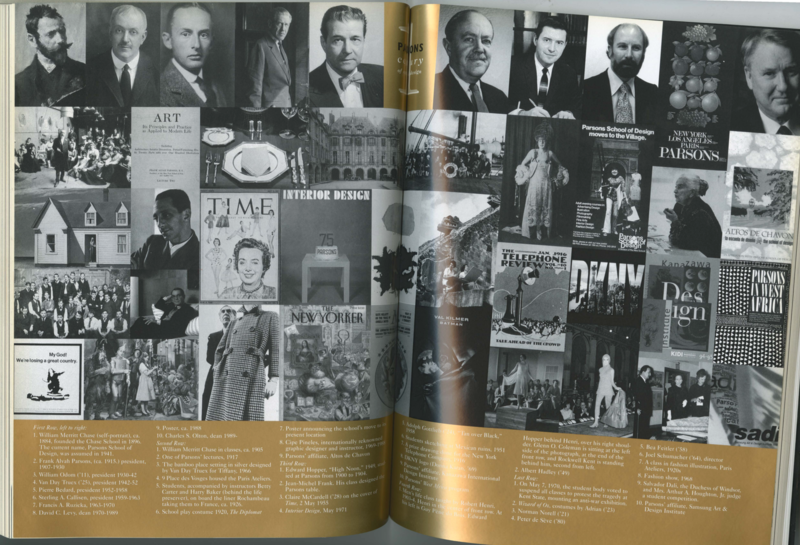 Yet the experience of the Parsons centennial suggests some things that all centennials have in common, especially those of institutions which were designed to meet the needs of their own time rather than those of the ages. It also highlights the rather different ways such institutions finesse arriving at triple digits. The New School would never have claimed to have begun with “a minor event.” It was world-changing from the get-go, the ringing articulation of a brilliant idea whose urgent necessity has never flagged. Parsons, at least when its centennial was happening, was happy to tell of a gradual evolution. Today the New School hems and haws at a history which, on closer inspection, is full of diversions, digressions, and discoveries. The 1896 “minor event” with which the proposed 60 Minutes script started was painter William Merritt Chase’s founding of the Chase School of Art. Renamed the New York School of Art two years later, in 1909 it left Chase behind and became the New York School of Fine and Applied Art. In 1942 it was renamed again in honor of the man whose vision had come to define the school, Frank Alvah Parsons (1866-1930). It is admittedly something of an ungainly history. Chase’s commitment to plein air painting mixed uneasily with Parsons’ celebration of industrial production, and the shift seems to have been acrimonious rather than organic. The jagged storyline has never been a source of embarrassment, however. The school bearing Parsons’ name for the last eight decades seems happy to tell the story of a legendary school arising out of unassuming origins. Few at Parsons, or at The New School, would tell the story this way today. This is not only because times change but also because the potentialities established by Parsons’ merger with The New School have only come to fruition in the last two decades. Striking in 1996 is the virtual absence — except as a deus ex machina — of The New School in the story of Parsons’ mission or future. It should be noted that the New School’s absence from Parsons’ self-understanding is paralleled by Parsons’ absence from the New School’s storytelling at its 75th anniversary two years before. 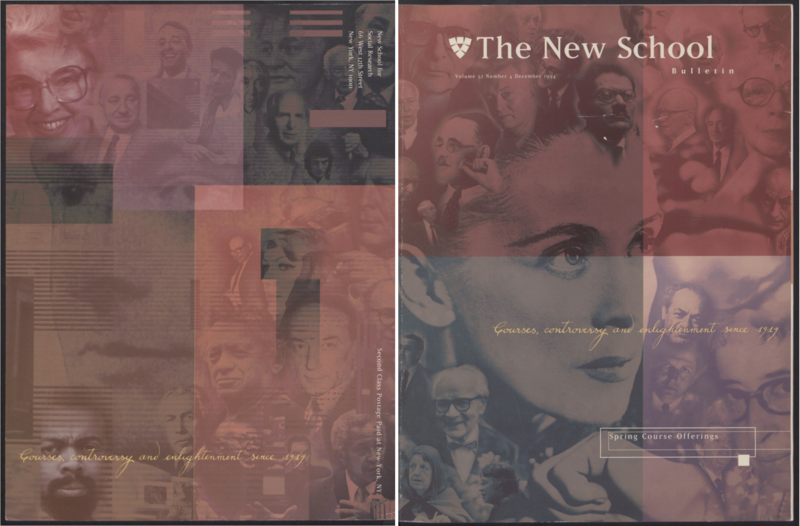 The collage Sanjay Kothary produced for the cover of the Spring 1995 New School Bulletin includes fifty famous New Schoolers from every discipline and decade, but not one star from the Parsons firmament. We’ve come a longer way than we realize toward integration over the past two decades. Parsons’ current self-understanding as a “diverse international community disrupt[ing] the status quo, fostering social and environmental good” would have been as unimaginable to Parsons at one hundred as today’s vision of a place where “design and social research drive approaches to studying issues of our time” would have to the New School at seventy-five. Even a quarter century after the New School-Parsons merger of 1970, the synergies currently central to the university’s identity weren’t recognized even as potentialities. Telling the story of The New School at one hundred is challenging because of the diversity and long-time autonomy of its component parts — some of which, like Parsons, are older than it is. But there is another difficulty. Unlike Parsons, which has made the fitting of taste to new circumstances and markets central to its ethos, the New School has difficulty recognizing the obsolescence of past self-understandings. The fateful word “new,” grown stale with overuse, jealously refuses improvement and brushes aside the possibility that it might ever be mistaken. The first founders of the New School may not have expected the venture to last more than a decade. They would surely have been tickled to see the New School centennial logo imply that we’d always had 100 years in us. Can what was intended as a liberation from the burdens of tradition still liberate when it becomes venerable? A big anniversary like a centennial is an awkward opportunity for an institution created to respond to the crises of its time, but it is an opportunity nonetheless. A certain amount of resting on one’s laurels is perhaps required, but celebrating the obstreperous heterogeneity of our legacies might help us resist the temptation to tell too linear a story. The benefit of hindsight lets us see potentialities our forebears didn’t; no one, however, is served by telling a falsely assimilating story in which the New School’s founders somehow knowingly laid the foundation for the congeries of schools we have become. The new was, at every stage, a guess, not a certainty. New fields and alliances were taken up and dropped. One way to leaven our centennializing is to look at past anniversaries, tittering at their dated ways of understanding themselves as timely and as timeless, noting balls dropped and bullets dodged along with genuine moments of serendipity and what Hannah Arendt called natality. When the New School celebrated its half-century in 1969, one outside analysis gave a penetrating account of “The New School at Middle Age,” describing a three-part institution comprising “an interesting but essentially frivolous menagerie,” “an unimaginative mediocrity” and a “youthful but potentially valuable experiment.” The “menagerie” was the Adult Division, today nearly atrophied; the “mediocrity” was the Graduate Faculty, which would almost lose its accreditation in the next decade. The “experiment” was the New School College, a forgotten predecessor to Eugene Lang College of Liberal Arts which was begun with fanfare in 1966 and abandoned without comment five years later. 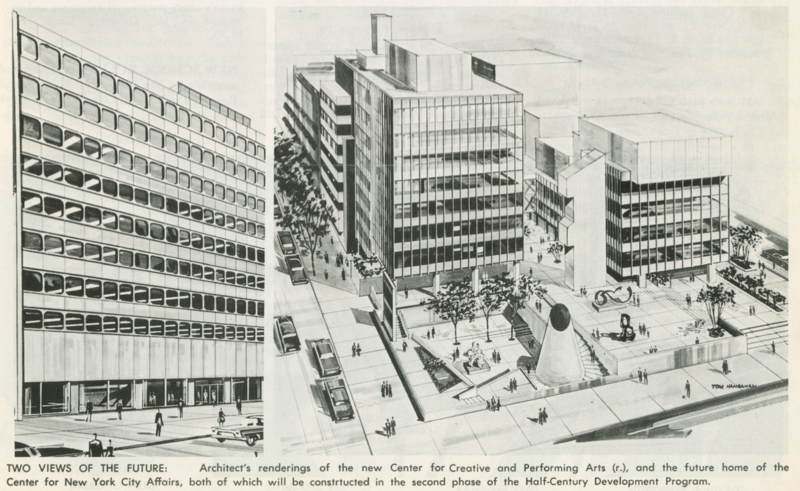 For its part, the New School saw a bright future in urban studies and in the performing arts, as shown in the plans for an extended campus that President John R. Everett shared in the New School Bulletin in January 1969 (below). No one, inside or out, could have then imagined that the school’s fortunes would instead be shaped by a merger with a design school uptown. In fact, neither Parsons nor the New School lends itself easily to centennial commemoration. Parsons, because it started small, bound to an individual founder and so to a human lifespan; because it continually started and restarted. The New School, because a century of newness sounds like an old joke. The merger of these institutions — with additional mergers and the rise and fall of new programs — makes a linear storyline harder still. But maybe this is a good problem to have. One way of enjoying one’s age is to be able to celebrate the different temperatures and temptations of anniversaries of different scales in rapid succession. The Media Studies program recently marked its fortieth anniversary, Jazz its thirtieth, the Graduate Faculty its eighty-fifth, the India China Institute its tenth, and Mannes a century of its own. How we mark the unfolding relationships of our many moving parts may matter less than why. What vantages, we might wonder, can the fiftieth anniversary of the New School-Parsons merger bring in 2020? Maybe 60 Minutes can do a segment. 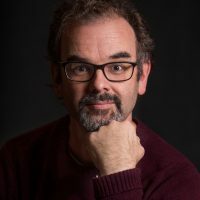 Mark Larrimore is the Program Director of Religious Studies in Eugene Lang College of Liberal Arts at The New School.